The annual survey is conducted by Hospitals & Health Networks magazine. 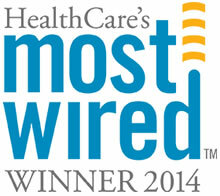 Emory Healthcare has been named a 2014 "Most Wired" health network for the fifth year in a row. The annual survey is conducted by Hospitals & Health Networks magazine and showcases health systems that utilize information technology to better connect disparate care providers and reduce the likelihood of medical errors. This year’s Most Wired Survey looked at four focus areas: infrastructure, clinical quality and safety (inpatient and outpatient), clinical integration (ambulatory/physician/patient/community), and business and administrative management. "There is not just one area of health care that benefits from innovations in technology. It is a part of everything we do, every day," says Dee Cantrell, RN, BSN, MS, chief information officer for Emory Healthcare. "That’s why it is so important that representatives across every discipline work together to continually ensure that the technology we use responds to the needs of our team members." Cantrell and her Information Services team partner with staff and physicians across Emory Healthcare to support all enterprise-wide and specific department systems and applications within the seven Emory Healthcare hospitals (Emory University Hospital, Emory University Hospital Midtown, Emory Saint Joseph’s Hospital, Emory Johns Creek Hospital, Emory University Orthopaedics & Spine Hospital, Emory Wesley Woods, Emory Rehabilitation Hospital in Partnership with Select Medical), Emory Clinic, and Emory Specialty Associates’ physician practices. Experts say that shared health information allows clinicians and patients to have the information they need to promote health and make the most informed decisions about treatments. "Appropriate health care technology empowers patients, enhances patient care and improves your work environment," says Cantrell. "At Emory Healthcare, shared decision making and authentic collaboration has been key as we have moved forward on our technology journey." The 2014 Most Wired survey was conducted in cooperation with McKesson Corp., AT&T, the College of Healthcare Information Management Executives, and the American Hospital Association.